You will explore a new island each day, using a mix of activities. As well as the familiar cycling and walking, you will have opportunities to surf on the waves in your kayak, and to harness the wind for an exciting ride on the sand in a tiny, kite-propelled buggy! There are so many to choose from, you can also mix activities based on your whims if you prefer not to follow the plan. This is a fascinating active holiday with pleasure and thrills in the magical Îles de la Madeleine. Connected by long, thin, sand dunes to form a crescent in the middle of the Gulf of St. Lawrence, this archipelago is a summer paradise for activity, shrouded in the mystery that comes only with the isolation these islands enjoy. 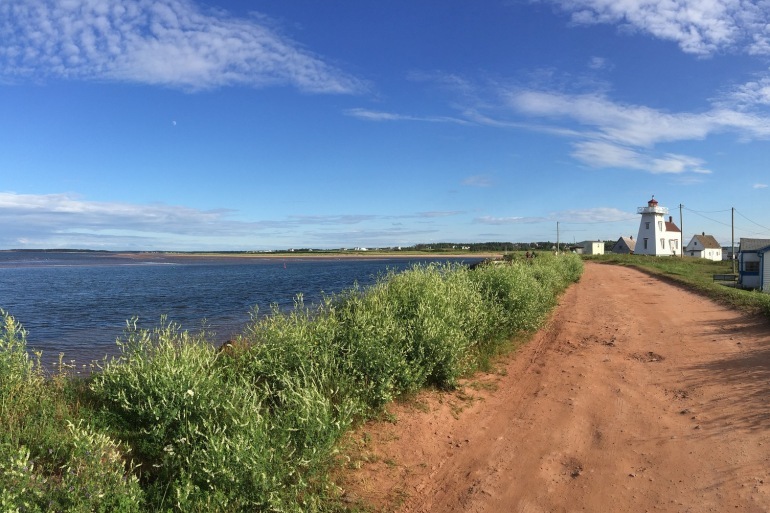 The adventure starts with a ferry trip from Prince Edward Island across the warm Gulf waters, in time for a wonderful introduction to the fabulous French cuisine. Your guided exploration will commence the following morning, and your days will give you an appetite for the fabulous cuisine you’ll enjoy each evening. The landscape here is wild and fragile. The people, mainly of Acadian descent, mixed with shipwreck survivors who never left, have a strong heritage: French is the first language of the majority of the Madelinots, with an Anglophone minority population, and fishing is still their predominant way of life. Honest, hardworking, and friendly, they welcome visitors to share the special pleasure of their uniquely isolated, very Acadian lifestyle. Superb food, good humour, unusual thrills, and some of the longest and nicest beaches you'll ever see, are the highlights. Come and discover the magic. To learn more about the culture and heritage of the Magdalen Islands watch Legends of Magdalen, a documentary about the shipwrecks, myths, and legends surrounding the islands. Freewheeling directors Cathy and Philip are involved with a bicycle advocacy board, whose mission leads it to follow the excellent example made by Quebec’s bicycle network - la Route Verte. Studying la Route Verte led to the discovery of some wonderful routes, perfectly suited to Freewheeling’s week-long holidays. Some of our past guides came from Quebec and helped us discover the little things that make a trip outstanding. We now frequently travel to Quebec for biking and skiing, and having become familiar with some fine inns and cuisine in rural Quebec, have developed five unique itineraries in superbly scenic and fascinating regions. Freewheeling Adventure is a travel operator designed for cyclists. Some Freewheeling Adventures are designed for expert cyclists and include long distances, steep terrain, and daily challenges. No reviews yet for this trip. Browse other reviews below for Freewheeling Adventures . Transfer from Charlottetown before noon, or meet in Souris at 13:00 for the 14:00 ferry to Les Îles-de-la-Madeleine. After dinner, visit the Café de La Grave, where the locals gather in the evening for music and laughter. Day 6: Extra day for options! Early morning ferry back to PEI. After lunch on board, you will arrive in Souris by 14:00, and will commence the 45-minute drive to Charlottetown right away. Finish in Charlottetown by about 15:00. All details and pricing are subject to change without notice. 5% sales tax applies. 50% tax refund for non-Canadians.